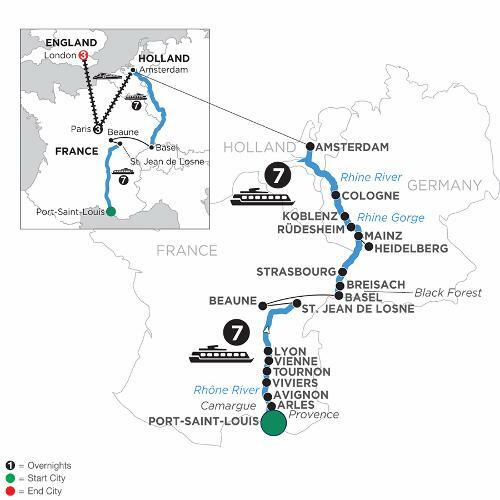 Incredible river views are yours to experience on your European river cruise on the Rhône and Rhine Rivers. You’ll embark in Port-Saint-Louis and sail for Provence on the Rhône River to visit Arles, with its 1st-century Roman amphitheater still used today. Attend a painting workshop in the style of Van Gogh whose work was inspired by the setting here. Cruise to historical Avignon and see the 14th-century Palace of the Popes—the largest gothic fortress in the world. Continue to Viviers for a guided walk through this charming village. Beautifully nestled among vineyards, you’ll find the twin cities of Tournon and Tain l’Hermitage, where you’ll go on a guided walk of Tournon, a medieval treasure with plenty of Roman ruins and fascinating 16th-century castle. You’ll visit Lyon, a showcase of medieval and Renaissance architecture, as well as France’s gastronomic capital. Lyon offers wonderful sights, including the popular Place des Terreaux with its famous fountain seen on postcards, and world-famous cuisine to discover on a guided culinary walk. The Rhône portion of your cruise concludes in St. Jean De Losne for an excursion to Beaune. You’ll see Van der Weyden’s “The Last Judgement” gracing Beaune’s Hotel-Dieu Charity Hospital—built in 1443. From Beaune, you’ll transfer to your Rhine River ship in Switzerland, and cruise from Basel to Breisach to visit the largest wine producer in Europe at Badischer Winzerkeller winemakers, and take a tour of Germany’s southernmost wine country for a wine tasting. You may otherwise choose to join us for a full day in the Black Forest to see its open-air museum, water mill, and traditional butter making. Take a guided tour of La Petite France District in Strasbourg and see the stunning stained-glass cathedral with its ancient murals, and astronomical clock. Your Rhine River cruise continues to Mainz for a guided city walk to visit Gutenberg printing museum or an excursion to magnificent Heidelberg Castle. Visit the marvelous Siegfried’s Mechanical Music Museum in the wine region of Rüdesheim and hear German music played by some of its 350 self-playing instruments. Sail through the spectacular Rhine Gorge from Rüdesheim to Koblenz, passing the Rock of Lorelei of mythological sirens and ill-fated sailors. Visit Cologne—a dynamic and historic city with its signature gothic cathedral and soaring twin steeples. Take a guided tour of the city or choose a walking tour of Cologne’s historical Jewish sites. You’ll experience the color and character of Amsterdam with a guided canal cruise on its iconic waterways past homes of the Golden Age. Continue your vacation in style with three nights each in Paris and London. Begin by exploring one of the world’s most romantic and vibrant cities! Arrive in The City of Light via high-speed train from Dijon to see Notre Dame Cathedral, the Eiffel Tower, and the Louvre Museum with its elegant glass pyramid contrasting its ancient architecture. Continue your European vacation your way with three brilliant nights in London! Travel via high-speed Eurostar train from Paris to London. Enjoy buffet breakfast daily, guided sightseeing in London, assistance by your personal Monograms Local Host®, destination guide with city map, high-speed train service, with complimentary transfer to and from train, hotel, and airport.